Omise: How do I transfer (withdraw) my balance? How do I transfer (withdraw) my balance? It’s simple to transfer money from your Omise account to a connected bank account. There are two ways you can do this. 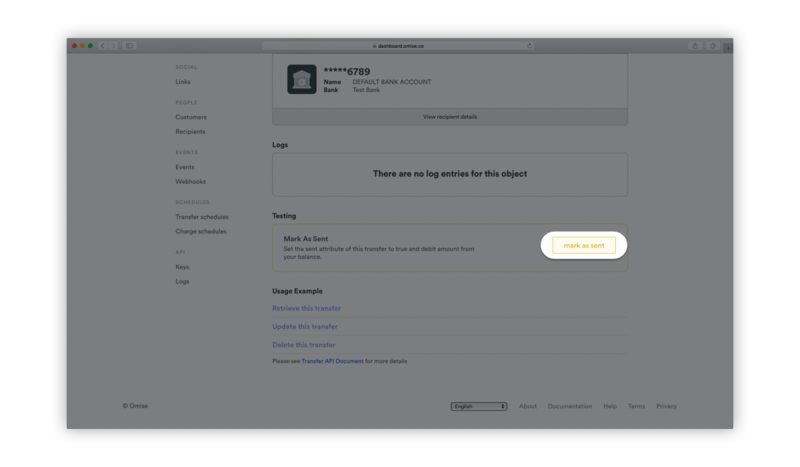 You can either implement the Transfer API or set up a transfer through your dashboard. The concept of transfers at Omise is similar to bank transfers, however we batch them and process them once a day (at 10:00 AM). You are able to initiate as many transfers as you may require, but the oldest one will be sent first. The amount of funds you transfer must not exceed the amount in your 'Transferable balance'. In this article we will be going through the steps to help you set up a fund transfer through the dashboard. Read through Transferring funds to learn how to use our API to send funds to bank accounts. The image below shows an overview of the transfer process. Payments you receive from your customers are kept on hold for a period of 7 days. During this period the collected funds are kept under your 'On hold' balance. Once it's cleared, the amount will automatically be moved to your 'Transferable balance'. You can find the amount available for transfer in your account under 'Transferable balance'. Once a transfer is initiated, the request is first sent to the bank for verification before the funds are deposited to your bank account. To create a transfer you must have a minimum of 30 THB in your transferable balance and there cannot be another incomplete transfer being processed. You can choose to do either a full or partial transfer. An unsuccessful transfer will be marked as Failed, while transfers that are on hold - waiting for the right conditions to be met - will be marked Pending. 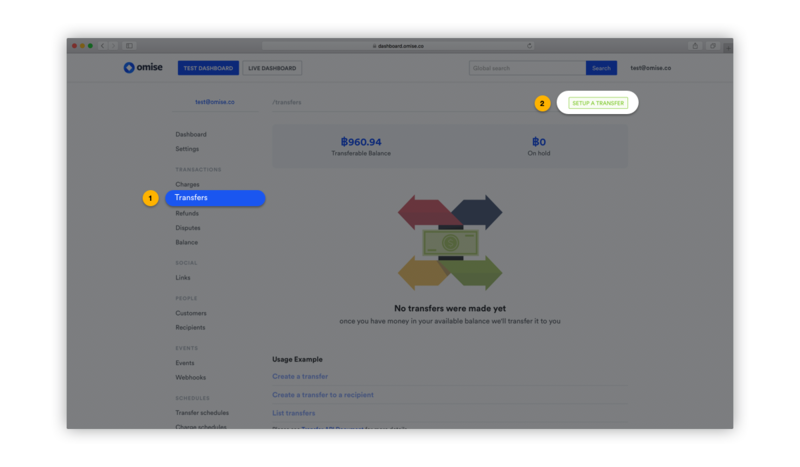 You can test fund transfers in your test dashboard. 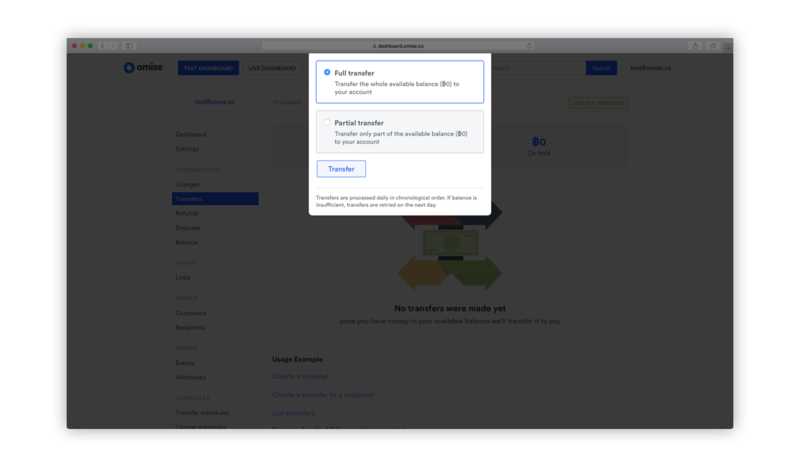 Once you have set up a transfer, you are able to change the status from the dashboard. ‘Mark as sent’ indicates that the transfer request has been sent to the bank. ‘Mark as paid’ indicates that the funds have been deposited to the bank account. *Note that the test dashboard is only meant to show you how things work. No live transfers take place. Transfers that are lower than or equal to THB 2 million are charged at THB 30 per transaction. Transfers that are over THB 2 million are charged at THB 150 per transaction. Transfer fees are set by the bank and cannot be negotiated. How do I delete a transfer request?